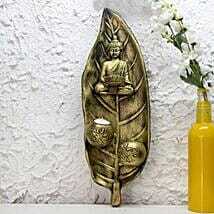 "Loved the experience of using fern n petals for delivering things to our loved ones. Will definitely use it again in the future!" "It had been always a good decision to order FnP... 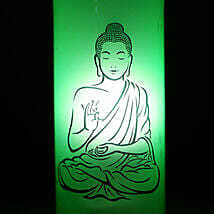 Always on time n good quality products"
"Amazing service and great product"
"Great service. Despite first ordered gift reached the recipient in a broken condition, FNP reordered another piece and made our day! Brilliant. We are overwhelmed with the attitude." 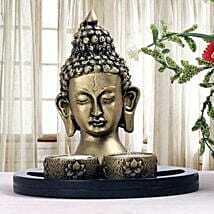 If you are seeking peace and tranquility in the New Year, enhance your décor and buy Buddha statue. 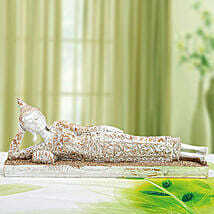 Send gifts online without stirring from your home. 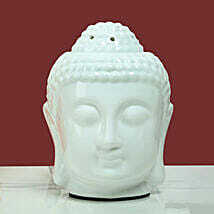 The meditating Buddha is a sure way to heal you and others and eliminating the inner ills of attachment, ignorance and anger. 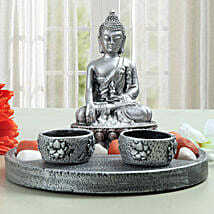 Get a serene hamper of a resting Buddha with a three layered lucky bamboo plant in a glass vase with one round silver candle and invite good fortune to your home. 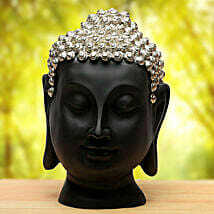 The Black Thai Buddha head is made with intricate detailing, and this beautifully crafted Buddha head ornament complements both classic and modern interiors. Capture the exoticisms of the Far East with this delightful piece. 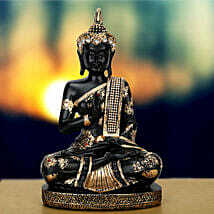 Balance life with Buddha, Buddha is an unusual gift. 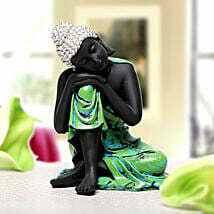 Deepen your spiritual and meditative practice by creating a sacred space. 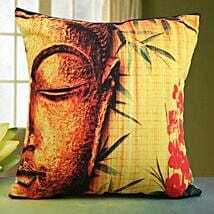 Enlighten your surroundings with this Buddha cushion and T- light holder candle from Ferns N Petals. 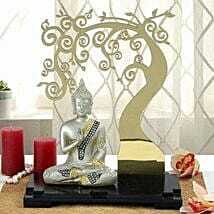 Add visual charm while bringing in peace and divinity to your surrounding with this serene hamper- the composed Buddha Hamper, from Ferns N Petals. 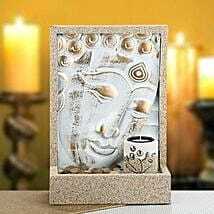 Hamper includes resting Buddha figure sitting contemplatively with his head on his knee, with beautiful detailing to the antiqued finish head dress and robe along with potpourri, 1 round silver candle and 2 layers lucky bamboo plant in a glass vase create the perfect gift.